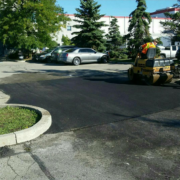 asphalt paving contractors Archives - RIMA Con Ltd. Whether you need to install a completely new driveway or need to vastly improve your current one, you’ve got options in terms of material. In particular, asphalt and concrete tend to be the most common materials for driveways. The question is, which one makes the better option? What Are These Driveways Made of? Both concrete and asphalt are made from the same general type of material – stone and sand. The difference lies in the adhesive. For asphalt, the adhesive is tar, while concrete’s adhesive is cement. It is these two substrates that give concrete and asphalt their unique traits, and also affect the strength, maintenance, and costs associated with each. Tar might be cheaper than cement, but it’s softer and can degrade faster and easier. But with adequate, regular maintenance, you can effectively reduce this degradation. How Long Do Asphalt and Concrete Last? Generally speaking, asphalt tends to last about 20 years, while concrete can last up to 30 years. Of course, the quality of the initial paving and the amount of maintenance and upkeep play important roles in the lifespan of each type of driveway. How Soon After Can the Driveway Be Driven On? Asphalt takes very little time to cure, and can usually be driven over after 24 to 48 hours. Concrete, on the other hand, takes a lot longer to cure, and requires at least a week before it can be used. Cracks are inevitable over time, regardless of which type of material you opt for. However, the method of repair can vary between the two. Small cracks in asphalt can easily be sealed, but larger cracks might need to be completely removed and replaced. Cracks in concrete may warrant replacement because repairs on this type of material tend to be unsightly and compromise the entire look of the driveway. How Well Does Asphalt and Concrete Hold Up in Weather Conditions? Asphalt is able to expand and contract with changes in the weather, which makes it more flexible and more resistant to cracking as a result. On the other hand, concrete can crack more easily under extreme pressure as a result of harsh weather conditions and surface movement. The exact look of asphalt and concrete ultimately depends on the individual. What may be attractive to one person may not be to another. Having said that, there are more options that come with concrete as far as the final finish is concerned. Different patterns, finishes, and even colors can be chosen for concrete driveways. All these options provide many ways to create a highly customized, unique look. Regardless of the advantages and disadvantages of both concrete and asphalt, if the foundation underneath isn’t stable, major problems will arise shortly after installation. 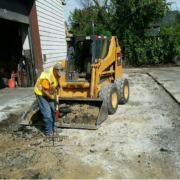 Both asphalt and concrete driveways require solid foundations that are prepared by the experts in the industry. At the end of the day, a driveway is only as good as what lies underneath. There are plenty of advantages and disadvantages to asphalt and concrete, but they both make sound choices for driveways. Depending on your budget, needs, and tastes, the choice between concrete versus asphalt will be a unique one. The most important factor to consider is the company you choose to install your driveway. Regardless of the material, a job done right will make a huge difference in the durability and aesthetics of your driveway. http://www.rimacon.ca/wp-content/uploads/2017/02/mariorimacon.png 613 611 admin http://www.rimacon.ca/wp-content/uploads/2018/05/Logo.png admin2017-02-21 17:23:062017-02-21 17:25:39Asphalt Vs Concrete For Your Driveway: What’s the Difference?